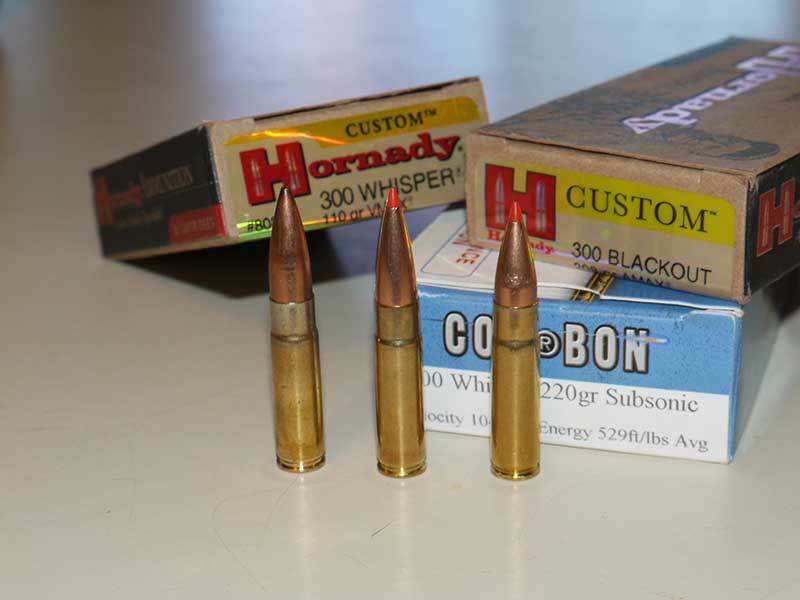 Can you tell which of these cartridges is a .300 Blackout, not a .300 Whisper? — No? Neither can your rifle. Black Rain’s BRO Urban Rifle in .300 Blackout fired this 1 ½-inch group without a silencer using COR-BON’s 220-grain subsonic factory load. The scope is a Firefield 2.5-10X40 with red and green illuminated mildot reticles. It also has a side-mounted red laser for CQB scenarios. A couple of weeks ago, I mentioned a rifle from Black Rain Ordnance that was consigned to me for T&E (test & evaluation). The rifle, a Black Rain BRO Urban rifle is chambered for .300 Blackout and is designed to use Black Rain’s proprietary silencer. I just spent the afternoon at a local shooting range to try the rifle out with subsonic and supersonic ammo—but without its silencer. The rifle isn’t quite ready to mount a silencer because it is a screw-on device, and a very bad-a#%-looking flash hider/muzzle brake is in the way just now. That needs to be removed before my shooting session with the silencer attached, which will occur mid-week. I mounted a Firefield 2.5-10X compact riflescope for the test. This scope has a red/green illuminated mil-dot reticle and is equipped with a side-mounted red laser for close quarters battle (CQB) scenarios. This bad-a#% flash hider/muzzle brake will have to come off before we can attach Black Rain’s proprietary silencer. It took a few shots to get a proper zero at 100 yards. As you might guess, supersonic loads had a considerably different impact from the subsonic loads. The Firefield scope has a bullet drop compensator dial set up for the .223/5.56mm cartridge, and I found that 300 yard setting for the subsonic load and the 100 yard setting for the supersonic load worked perfectly. With a decent zero established, I was able to shoot 1-1/2 inch groups (roughly) with the supersonic Hornady 110 grain load and the subsonic CorBon 220-grain load. This was mostly horizontal dispersion with ½ inch or less vertical dispersion in both cases, so I suspect the culprit might be sighting error that a high-power varmint scope and a steadier rest might fix (I used Caldwell front and rear benchrest bags). I should point out that both factory loads were headstamped “.300 Whisper,” not “.300 Blackout,” which underscores that the two chamberings are virtually identical, despite what the AAC people tell you. At least two major companies, Hornady and Smith & Wesson, say so explicitly (not to mention SSK Industries, which developed the .300 Whisper way back in 1992). Obviously, AAC has won the marketing battle, but don’t be fooled. The .300 Blackout is just a .300 Whisper in disguise. Now, back to the Black Rain test rifle. 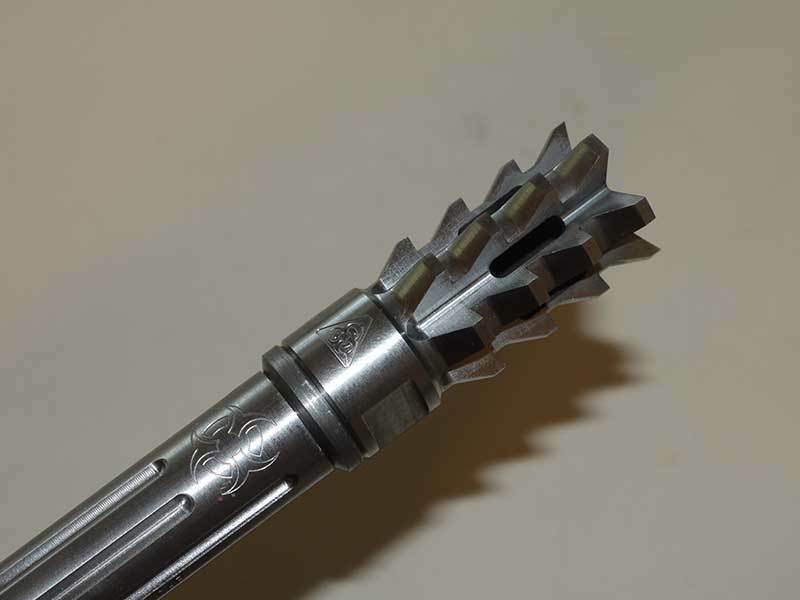 I don’t want to risk boogering up the metal work, so I’ll take a quick trip to my gunsmith, who should be able to remove the aforementioned flash hider/muzzle brake, toot sweet. Then, we should be able to attach Black Rain’s silencer and complete the T&E this coming week. With spring weather coming on, I plan to do a good bit of range testing in the next few weeks. This includes a tricked-out, AR-type, semi-auto pellet rifle by SIG Arms—along with a SIG .300 Blackout, a Mossberg .308/7.62 NATO scout rifle and a few others. I also plan to play with a few of my neglected, but favorite toys from the back of my gun safe. Stay tuned.